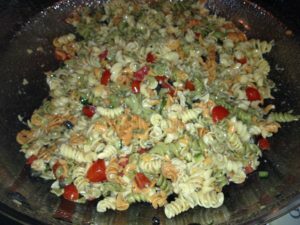 This simple pasta salad using Rogliano's dressing is delightful for any family gathering. Cook pasta according to directions. Add a little dressing to keep it from sticking. Allow pasta to cool. Add cucumbers, tomatoes and olives. Toss with dressing and enjoy. *You can also add pepperoni, cheese and additional vegetables.